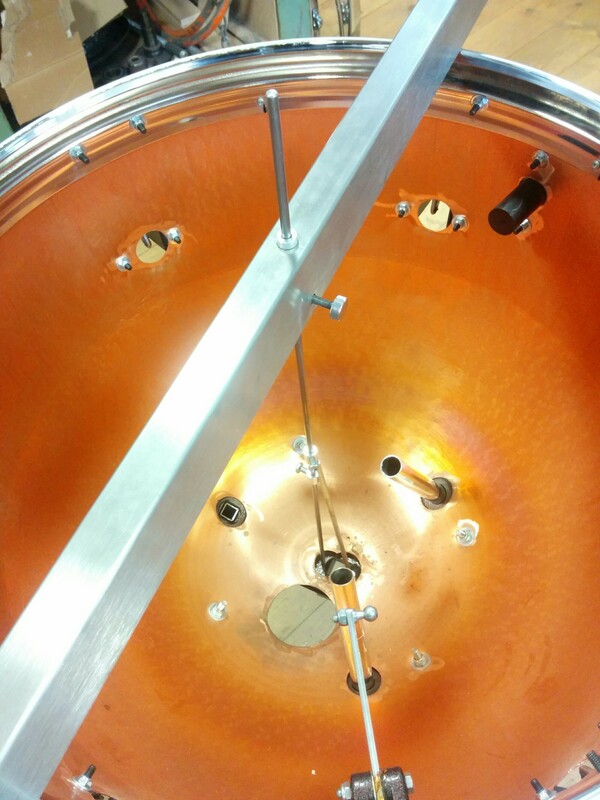 The Adam’s universal timpani are good little drums, the best thing Adam’s make, but they do have one major problem. The owner of these drums has decided to get me to rectify the problem. So what is it? 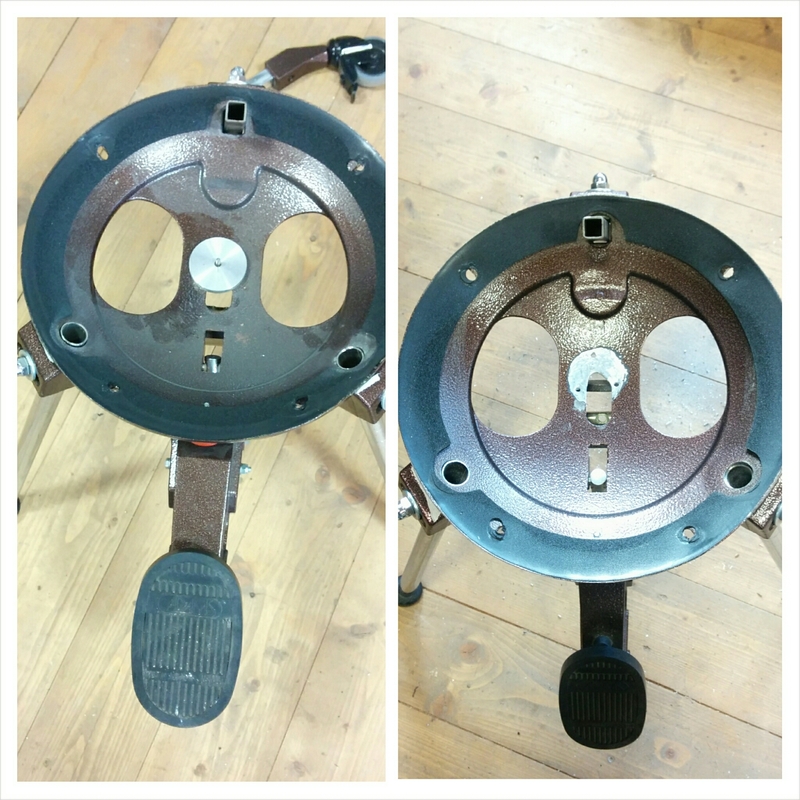 In a nutshell, when you change pitch with the foot pedal, it doesn’t pull in the centre. 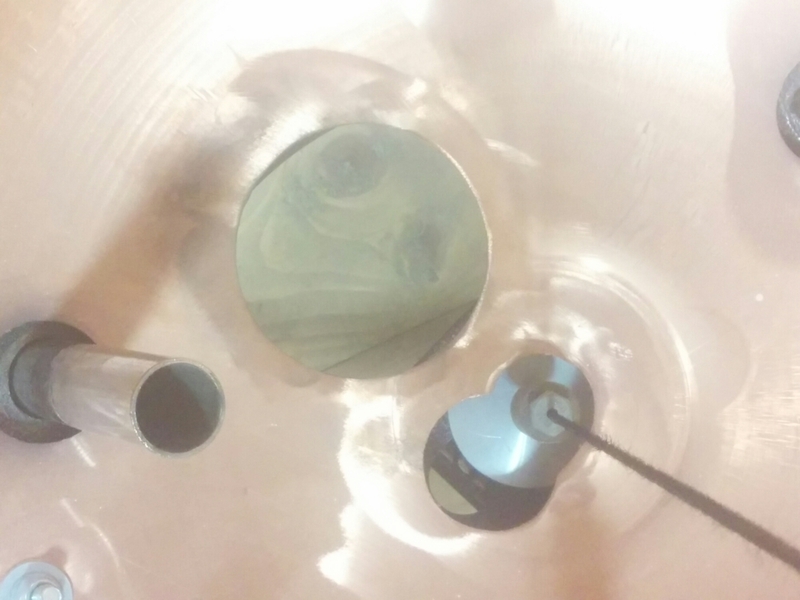 The bowl sits in a cradle that has three legs and a pedal incorporated. The pedal is a big lever that is attached at the back of the cradle. The central pull rod is attached to this lever, which becomes a fixed point along the length of that lever. 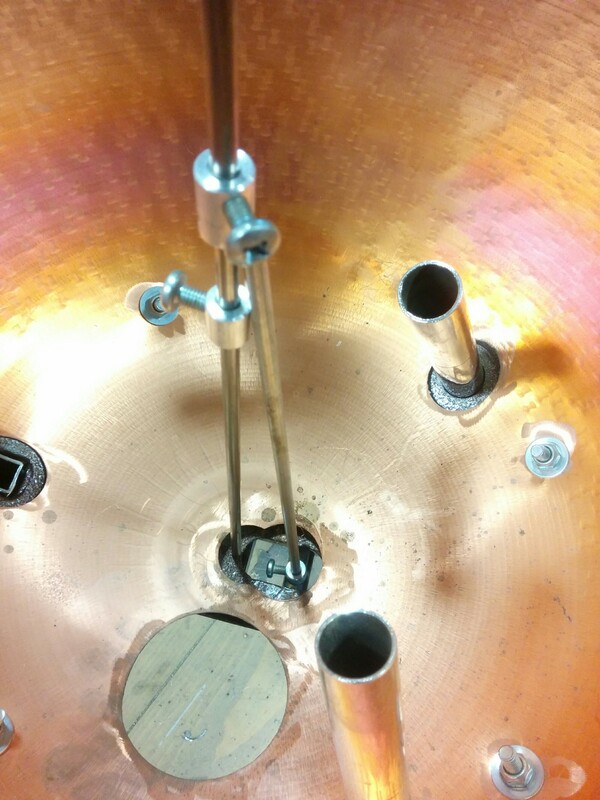 As the lever moves, that fixed point travels through an arc, not just up and down, so in relation to the centre line of the drum, is moves forwards and backwards. Furthermore, this fixed point is actually slightly to the front. Neither of these things is going to give consistent tuning, and is a massive schoolboy error – but just see how many other makes of timps have the same issue, at least this make can be resolved. In the picture above I am actually recording set up measurements so that the drums get put back together correctly, but it demonstrates the problem perfectly. I have dropped a rod down the centre line of the drum, and I’m recording how far the spider is pulled by the pedal. 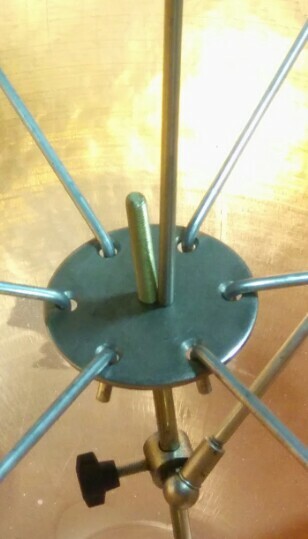 Looking closely, it is clearly visible how far from centre the original fixing point is by the size of the angle between the two rods. So what I do is to separate the central pull rod from the pedal by making a secondary linkage, but as you can imagine, it is a little bit more involved than that. These posts are essentially one days work. I need to take lots of measurements, which use lots of tools that have been made specifically for the purpose – so many tools that I need to do a job simply are not available. For instance, below I am measuring how much vertical movement down the centre line I will get on the new mechanism. 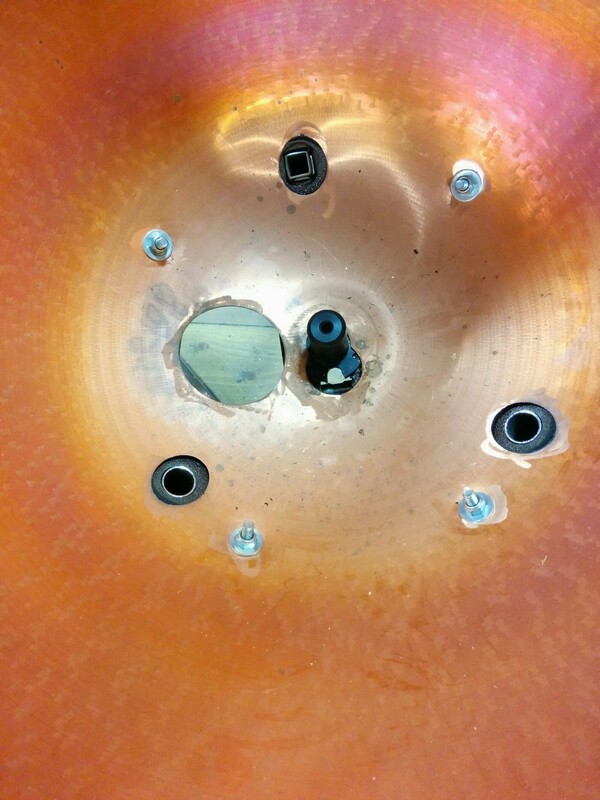 Once all measurements are taken and everything is removed from inside the drum, I can locate the centre of the bowl. 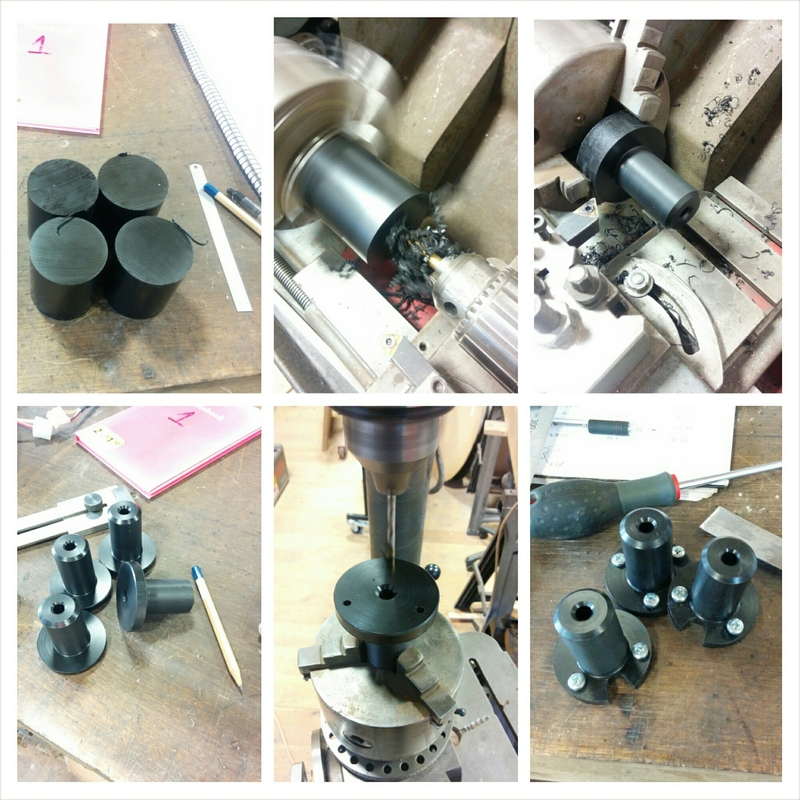 My design fixes the central pull rod in the centre at the base, and guides it vertically with a guide block. The bowl is removed from the cradle and the base casting can be prepared and modified if needed to accommodate the new design. Now I can fit the guide block and reinstall the bowl ready to start work on the next stage tomorrow.